Sapphires of all colors are incredibly beautiful and mesmerizing. However, if there is one color that tops the chart in terms of exquisiteness amongst all the other sapphires, then it has to be the alluring Yellow Sapphire. The vivid and vibrant yellow sapphire is attractive enough to win the hearts of the onlookers at an instant. But, it is important to judge the yellow sapphire color before buying it. The subtlety and gorgeousness of these gemstones couldn’t be contested. Not only is the color of these gems a charming factor, but it also has a crucial role to play when it comes to reaping the astrological benefits of this stone. Available in hues that range from greenish yellow to orangish yellow and possibly all other colors that lie in between, one of the highly preferred yellow sapphire color is a vibrant canary yellow which carries a tinge of yellow to orangy yellow and a vivid saturation that very well highlights the beauty of the stone. How Yellow Sapphires get their amazing color? There is no denying that yellow sapphires have been a trusted choice for many gem lovers and even celebrities, thanks to their striking resemblance to the yellow diamonds, but this color comes because of two reasons. The presence of iron is one of the chief reasons why sapphires get their yellow tone. 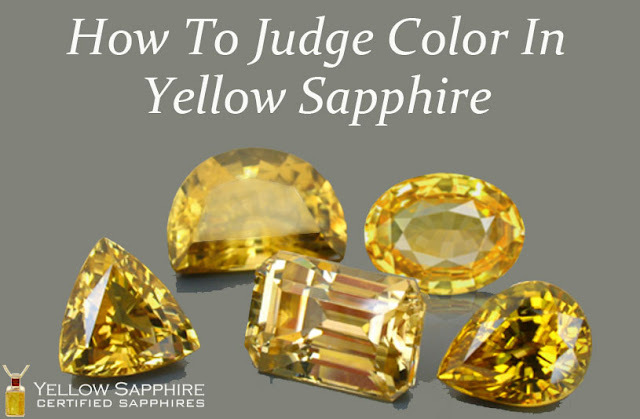 The higher the concentration of iron in a yellow sapphire, the more will be its color saturation. The presence of trace element titanium results in an unwanted green tinge in yellow sapphires. Gems that are free from titanium are often valued high in the market. Another reason for the yellow colored sapphires is the natural presence of the color because of low-level radiation that occurs inside the earth. This color can also be given through lab-induced irradiation. Even though the latter process does not pose any threat to the humans, the color of gems so produced fades with excessive or frequent exposure to light and heat. This is the reason why natural yellow sapphire is the most demanded one in the gem industry. Unlike its counterparts: pink, blue or padparadscha sapphire, the lovely yellow sapphire gemstone contains a better clarity and fewer inclusions, which makes it a truly desirable gemstone. The relative clarity of a yellow sapphire stone is convenient as the color’s medium tone doesn’t hide inclusions well. A rough yellow sapphire demands less value than the expensive blue, pink, or other sapphires. This is why cutters don’t let go the brilliance for retaining weight. Consequently, yellow sapphires that are cut rightly are quite easily found than other sapphires and one can have them in a variety of cuts in the industry with absolute convivence. There are various sources of yellow sapphire like Thailand, Tanzania, Madagascar, and Australia. But, yellow sapphires that are found in Sri Lanka are said to be of the highest quality of them all. Also known as Ceylon sapphires, Sri Lanka’s yellow sapphires are the prime examples of absolutely attractive, natural and untreated gemstones.